One of the greatest conversations in the history of humanity, when Allah spoke directly to Moses in the mountain! We will focus on one of the passages in the Quran, chapter Ta-Ha. Just like Moses was given the sign of the burning fire, Allah gives all of us signs in this life. Sometimes it is a verse of the Quran that may touch our heart, or a heart penetrating reminder. Sometimes it is just a person we meet who teaches us a lot, or just life circumstances. When Allah shows us signs, it is up to us to take them. Ironically Moses said that he would go and see if he could get a light or some guidance. 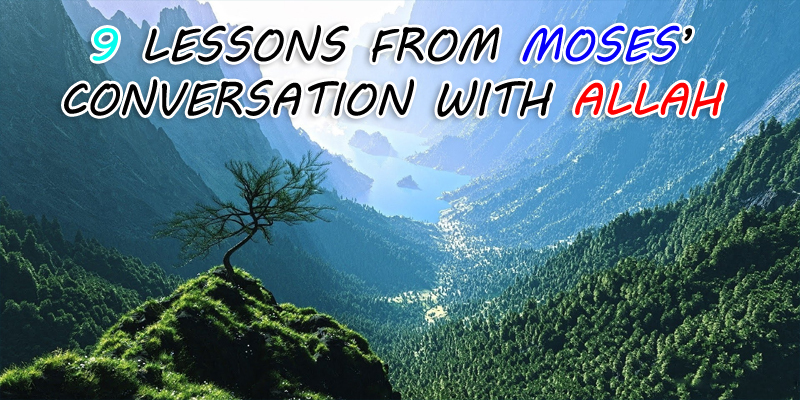 Allah through this conversation will give him the ultimate light of His words and ultimate guidance being the guidance from Allah! He has given us a light and guidance through the Quran, how much of it have we kept? Allah tells Moses that he was chosen to be Allah’s Prophet, and chosen among the thousands of babies killed to be saved. God chooses whoever He wills. He chose that you would be reading this article at this moment, while most people are not… He chose that I would be a Muslim while many are not. It is all from the blessings of Allah. The question is, how do you and I utilize the blessings? Remember the time you met someone you honored, admired, or someone who was a celebrity. Would you ever forget that? Hardly doubt so! Yet, Allah reminds Moses to establish the prayer so that he may remember Allah. And yet, Moses has just heard Allah speak. Would he ever have forgotten? How important then is our prayers and turning to Allah? Allah went on to remind Moses that if he was to turn away, then he might be punished as well. The best of people also need to be reminded of the judgment and of hellfire. The best of people also need to be reminded that other people might turn them away from Allah, so do not let that happen! If Moses can be reminded about Judgment Day, who are we to act arrogant whenever we are reminded of retribution? Who are we to think we are safe by our petty deeds when this mighty Messenger of God listens silently to the warning? After mentioning the main message of Islam to the Prophet Moses, Allah now moves on to give him an important training. Once Allah gives an opportunity to Moses to talk, he takes it with both hands! He keeps going on and on about his staff! How much do we talk to Allah when given the opportunity? Do we like to “finish off the prayer” or are actually trying to make time to talk to Allah? Moses mentioned all the blessings of his staff. Then Allah asked him to throw it down, and it became a snake- something very harmful! Everything in this world can be such. The proverbial example of the knife which can cut vegetables versus the same knife which can kill people is one to ponder upon. All the blessings in life are blessings which can be for us or against us, depending on how we use it! Another place in the Quran, it is mentioned that Moses ran when he saw the snake! And yet Allah asks him to pick it up. An order from Allah, and just like his mother many many years ago, Moses listens to the order of Allah and the snake turns back to a staff! Allah just taught Moses and by extension all of us to trust in the command of Allah. Whatever He commands is good for us, even if we may not know it, and if we truly trust Him, miracles will happen!